My Grandfather Isaac continues to build the foundation for his life, and begins his career as a photographer. After surviving the war, he now has to learn to navigate and survive the Soviet system itself. This is the middle of the story that is framed by two crucial journeys. The first was on a bicycle, over the dirt roads of Belarus. The second, nearly 50 years later, brought our family to America. Together with my father, Igor, we dig deep into our family history. Note: There are no photographs in our archives from my grandfather’s photography project, where he photographed a quadruple-amputee nurse Hero of the Soviet Union, Zinaida Tusnolobova. However, there’s quite a bit of information online about her. There’s also a small museum in Polotsk that appears to contain photos and artifacts from her life. Could my grandfather’s photographs be hanging on those walls? Here is a photograph of my Grandfather’s extended family in 1961. 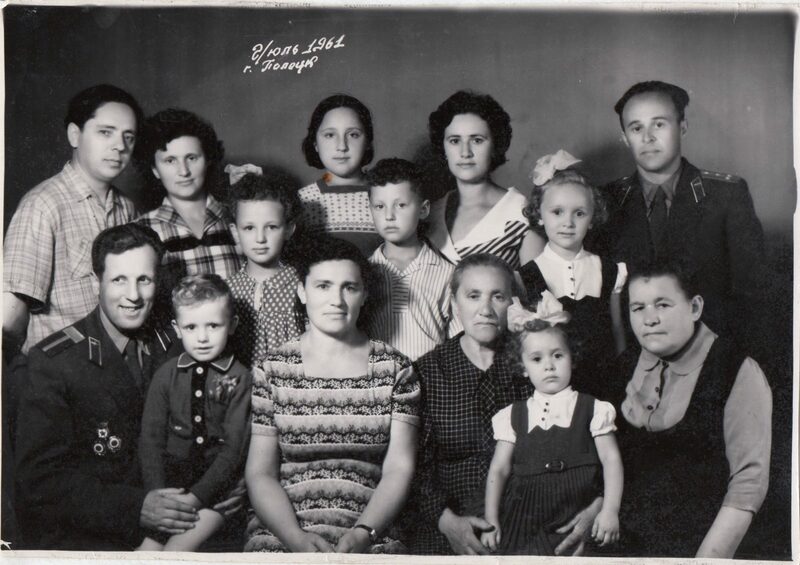 He is in the top left corner, with his wife – my grandmother – Ida. My father, Igor, is the 8-year old boy in the center of the photo. His sister, Laura, is above him on the left, in the back row.